From the beginnings of their 20th century imperial conquests until their surrender in 1945, and in more recent times, the Japanese have made numerous feature-length or serial documentaries that recount or examine their involvement in World War Two. The conquest of the Malayan Peninsula and the Battle for Singapore is often highlighted in the documentaries as one of the landmark events in their imperial exploits for a “Greater East Asia Co-prosperity Sphere”. I found access to four such documentaries, varyingly made in 1942 (in the heat of the Pacific War), 1975 (30 years after the surrender), 1992 (50 years after the start of the Pacific War), and 1999 (before the turn of the century). All of them had featured Singapore as film location to different extents. Synopsis: A newsreel compilation that documented the exploits of the Japanese army until early 1942. By then, Japanese forces had advanced as far as the Soviet-Manchukuo border in the north, to Sumatra and Australia in the south. This film visits many places along the front lines, including the Soviet-Manchukuo border, Zhengzhou, Changsha, Fujian in China, and Singapore, Thailand, Borneo and other areas in Southeast Asia. Map of the Japanese Battlefront in early 1942. Expansion of their military conquests in Greater East Asia. Three-prong attack down the Malayan Peninsula. Objective: シンガポール (Singapore). Probably in the vicinity of Lim Chu Kang and Kranji. The Japanese army had mounted a land assault through the northwest region of Singapore on the night of 8 February 1942. The British army surrendered Singapore to the Japanese forces on 15 February 1942. Upper left: Miltary vehicles camouflaged with palm leaves drive past the Municipal Building (now City Hall) and the Supreme Court in Singapore city. Upper right and lower row: The Japanese flag was mounted on the top of the Cathay Building, then the tallest building in Singapore. It was later used as the Japanese Propaganda Department Headquarters. Anson Road “Banzai”. Victorious Japanese troops posed for the media. Obedience is virtue. Synopsis: A documentary film about the Pacific war, using footage shot during the war by reporters from Nihon Eigasha and the U.S. military. Originally released in 1975 for the 30th anniversary of the end of World War Two. This was probably shot in Raffles College (now NUS Bukit Timah Campus) where Yamashita’s 25th Army had held a commemoration service for the war dead during the Battle for Singapore, on 2oth February 1942. More details about the event can be found in one of my earlier posts on “Mare Senki”. Synopsis: A two-part documentary produced by NHK to commemorate the 50th anniversary of the Pacific War, using footage recorded by Japanese, American and British journalists during the war. This is how シンガポール Singapore is introduced in the documentary. A shot of the defence installations and mines set up off the coast of Singapore. 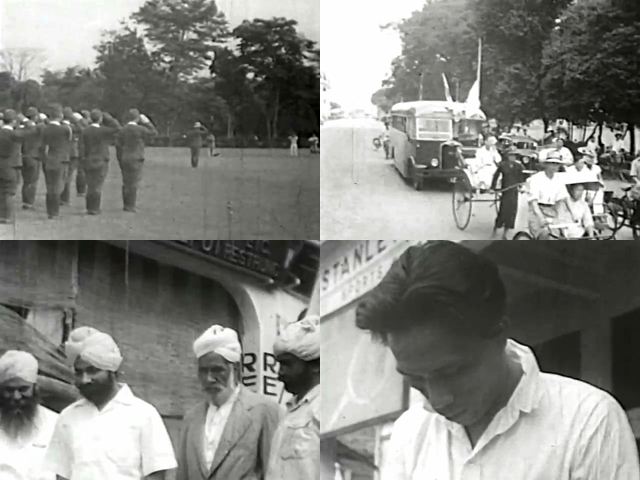 Other notable scenes from the documentary. Left: Burning oil tanks as viewed from a fighter plane. Center: Land assault on Singapore, Showa 17 Years, 9 Feb. Right: A tank passes by a kampung/village. Synopsis: A serial documentary that presents historical film records of 20th century Japan, organised into twelve episodes dealing with a variety of subjects and themes. 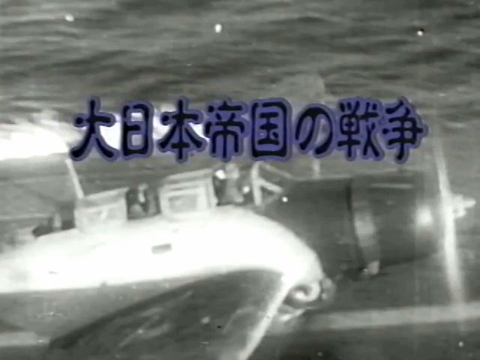 Episode 1 features “Imperial Japan’s War”, part of which covers Imperial Japan’s involvement in the second World War. Singapore is mentioned twice in the documentary — in the section on the Fall of Singapore (シンガポール陥落), and in the section on the new territories encompassed under the “Greater East Asia Co-prosperity Sphere” (大東亜共栄圏各地の素顔). Imperial Japan’s contrivance – 大東亞共榮圈 “The Greater East Asia Co-prosperity Sphere”. シンガポール Singapore is a prized possession within the “sphere”. In the documentary, Singapore is introduced with a shot of the city, with the Victoria Memorial Hall clock tower taking prominence. Upper left: A Japanese military parade, unknown location. Upper right: Common modes of transportation in Singapore – rickshaws, trishaws (first introduced during the Japanese Occupation) and the trolley bus. Two japanese flags adorned the front of the trolley bus. Lower left and right: Shopkeepers or by-standers? New subjects of Imperial Japan bowing their heads? Unknown location.